I have been working on my new web site Plymothian Bus Services which looks at Plymouths bus routes over time and hopefully will eventually build into a potted history of the bus routes in and around Plymouth. This site replaces my PT Extra site which got a bit out of hand and was beginning to look a bit of a mess. The new site is much more focussed and has a much tighter look and design. Other Details: Saturdays, Sundays and Public Holidays. Nice for people from Exeter who fancy a day out on the Moors – less useful for people at this end. 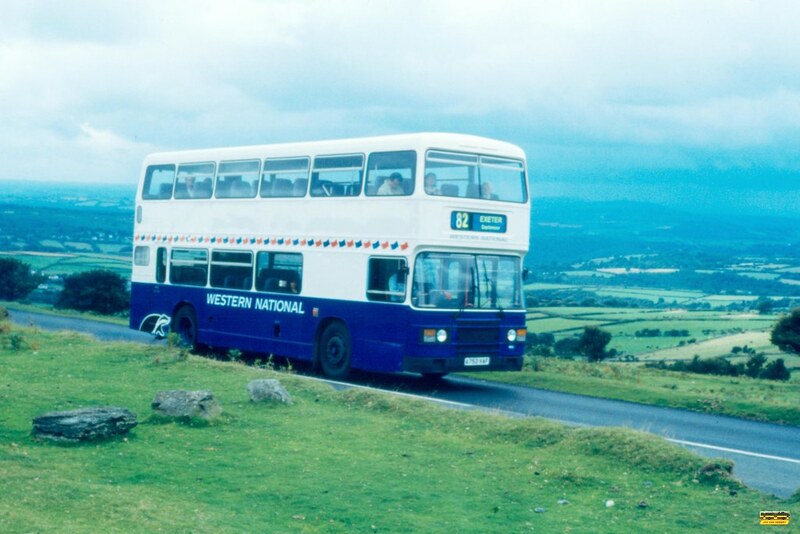 © Jos Van Hemert: Western National Leyland Olympian 1803 A753VAF - Dartmoor - 08-09-1994. The 82 is in a terminal decline it seems ... since they stopped using double deckers the number of passengers has declined massively ... and with far fewer passengers travelling, the use of single deckers will continue ... in fact the size of the single deckers is getting smaller ... a real shame as it was a fantastic route to do on the top deck ! The service no longer serves Plymouth because Plymouth City Council withdrew their portion of the funding. Therefore Devon decided to make the route terminate at Tavistock instead. As someone who used to drive the route regularly when it was a double deck operation I have to agree with the Chairman's comments. The views from the top deck were spectacular and from a driver's perspective the stretch between The Warren House Inn and Exeter was a technical challenge to any driver. There are in my opinion several reasons for the decline of this route. Although Devon County Council did market the route it was never fully aimed at the tourist market. Timetables were to a greater extent worked around the operator not the passenger. Fares were always on the expensive side - length of route, time, fuel, wages, etc, all adding to the cost. The advent of concessionary free travel would not have helped. With the reimbursement rate paid to the operator a passenger could make the two hour plus journey for free with the operator receiving under a pound for the privilege of carrying them. Perhaps a more subsidised fare would have helped. There was a reluctance on the part of the park authority to cut back trees along the route. Even when safety concerns were raised there was often a refusal to cut back trees. This was always going to have an impact on the double deck aspect of the route. It really is a shame as this could have been a significant tourist attraction if marketed properly. I believe that to make the route work it would need a joint operation between a Plymouth based operator and an Exeter based operator. This would make the timetable more realistic and more attractive to passengers. Some way of keeping fares down would help and a major tree trimming operation across the whole length of the route would ensure that double deck buses could be used safely. The buses should be branded internally and externally as is done with routes like the Coastliner in Yorkshire, and similar tourist area buses. Another example would be the Lakes Connection in Cumbria. Routes like the 82 can be made successful but it takes a partnership approach from everyone involved. Take a drive along the 82 route now, in a car and you will see that overgrown trees make the route impassable for double deck vehicles. Such a shame. I was so sad that the current Dartmoor Sunday Rover scheme is a mere shadow of its former self. The 82 has been slashed, even compared to the 2012 service. When I lived in Dawlish, friends would travel down to enjoy a day out using the myriad routes on summer Sundays, a stop at the Warren House Inn was always popular!. I see Widecombe-in-the-Moor is no longer served. Mind you the ticket is a bargain for anyone wishing to travel everywhere apart from Dartmoor on a Sunday! I remember a driver on the 82 advising passengers on the top deck that, 'due to the wet weather, passengers on the left hand side may be a bit worried as the tree branches would be banging against the bus so they may wish to move to an aisle seat'. Here in Scotland, Stagecoach have introduced open top decker routes on Deeside (200 - superb and very popular when I travelled on it on 6th May), around Lochaber (42) and, subject to confirmation, Skye (60X) and are continuing for the second year the T11 on Orkney. Of course Orkney has no problems with trees! The sad news re Dartmoor may prompt me to stay up even later and look at my archive pictures of the 82 etc.